Whether you are attending a SASS shooting event, Old West reenactment or just visiting the OK Corral, our clothing guide will get you ready to look your best. The most important thing to consider when developing a costume is your character and their backstory. Do you want to be a sherriff, saloon keeper or mayor of the village? Or switch to the dark side and be a stage robber or highwayman? As you think of the character's backstory, be sure to consider a few key characteristics for your persona, such as: gender, wealth, societal status, and future goals. These will help inform your costume choices. Once you have a clear character in mind, crafting an Old West costume becomes much easier, and it will give you a good idea of the sorts of outfit you need, plus the props and accessories you should consider. If you don't already have a character in mind, or would like to consider a fully coordinated look, please visit our Old West Costume Page to see all of the character outfits we've developed, which can be purhcased as-is or customized with different items. If you want a completely customized look, then it is time to start developing your own outfit. Cowboys' shirts were usually cotton with long sleeves to protect from the dangers on the range: sun, sand, thorny shrubs and cranky heifers. 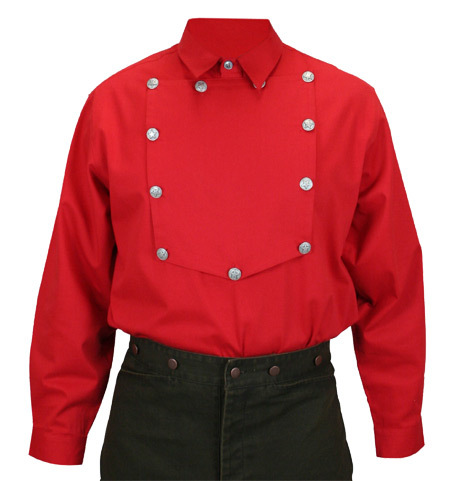 The Cotton Bib Shirt is an iconic and practical look for any cowboy. Since the scarcity of water made bathing and washing of clothes a luxury, the practical bib could be easily removed and cleaned or just flipped over to hide any stains until the next opportunity to wash came. Another popular style was the loose-fitting, band-collared work shirt. Since being a cowboy did not come with a large salary, cowboys also wore cotton work shirts made of whatever material was least expensive. Durable canvas and cotton were common choices in the hot summer, though many cowboys arrived as former soldiers and just continued to wear whatever remained of their uniform from the Civil War. Over the years a few practical changes were made to accommodate the rigors of the cattle drive. An extra layer of fabric was added to the pants to prevent chafing and the pants from wearing out from rubbing on the saddle, this became known as a saddle seat. Beyond the saddle seat pant, you also saw denim pants. Although Levi Strauss intended his denim pants for miners in Northern California, after their introduction in 1873 they came to be found on the open range as well. 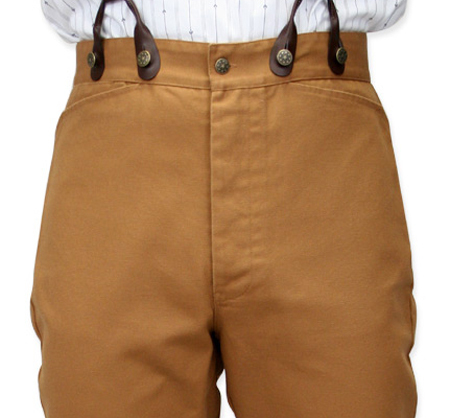 Also, the middle of the desert on a cattle drive was no place for a man's pants to fall down, so suspenders were a common and sensible addition to the cowboy ensemble. 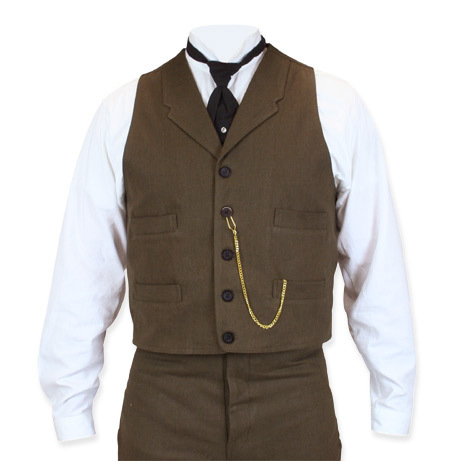 Pants pockets can be hard to reach when you are riding a horse, so vests were an important addition for the cowboy. The pockets provided a space to stash personal items and they also provided an extra layer of protection from the elements. Generally, cowboys wore vests with standard work shirts, but not if the cowboy was wearing a bib shirt. Durable canvas, wool, and leather were common vest materials. No sensible or self-respecting cowboy would be found on the range without a hat for protection. The commonly worn wide brim hats evolved from the sombreros of the Mexican Vaqueros who participated in the cattle drives and the hats brought from the east by new migrants. 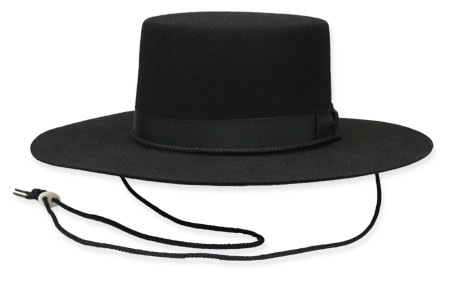 The wide brim was useful in the desert southwest for protecting the face from sunburn and minimizing glare from the sun. In 1865, the Stetson "Boss of the Plains" was introduced and became an iconic cowboy hat design. The cowboys most frequently wore military leftovers because they were inexpensive and tall to protect the legs from brush and other dangers. Boots with heels were preferred because they could hook on the stirrups and not slide through while the cowboy was riding. Later in the 19th century boot evolved to have a pointed toe, which made it easier for a cowboy to slide out of the stirrup and off the horse quickly when necessary. When in town, men in the old west would sometimes wear shoes or low ankle boots, similar to fashions back east. 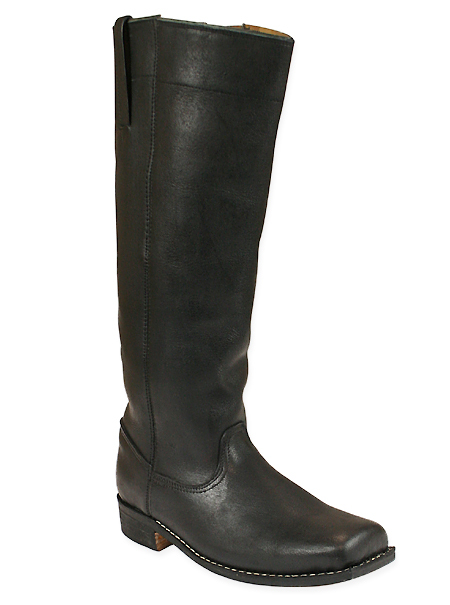 In a pinch, however, a tall boot was the most versatile and common footwear in the old west. Inexpensive and versatile, what more could any cowboy want? A bandana's primary purpose was to protect the cowboy from the sun and the dirt and grit of the trail. But they could also be used as a tourniquet, travel bag, washcloth or dust rag. Bandanas were made of silk or cotton, and also referred to as neckerchiefs or "wild rags". 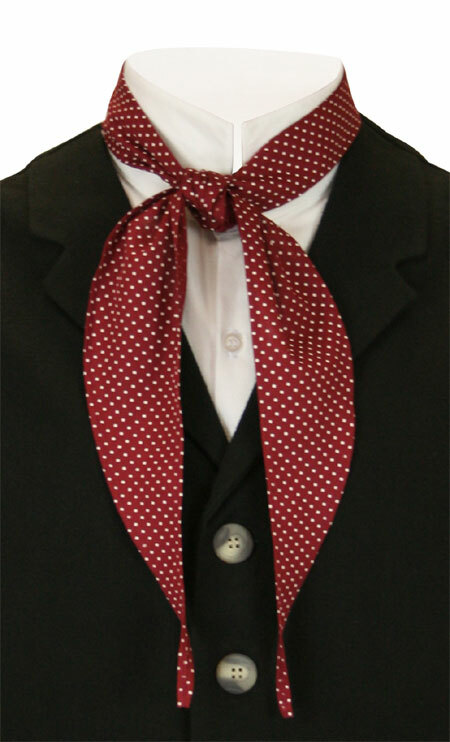 For dressier occasions, a cowboy might lace up a string tie or bow tie, or a "puff" tie of silk or cotton. 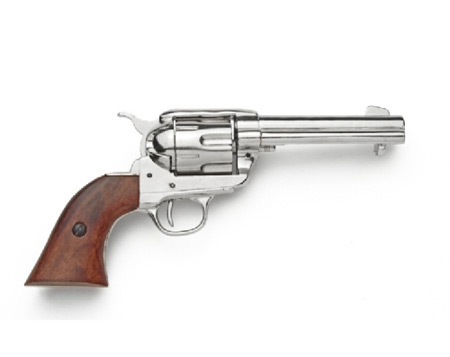 Snakes, coyotes and desperados were only a few of the dangers that the cowboys faced on the range, so many of them carried guns in a variety of styles. Pistols, rifles and shotguns could all be useful and needed to be protected but still in easy reach for a quick reaction. Gun leather is designed to fit the cowboy and his chosen armaments. 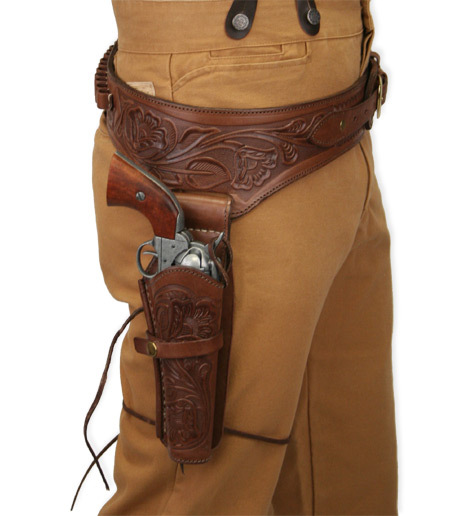 We carry a full line of leather cowboy holsters, as well as a variety of replica non-firing prop pistols and rifles for an authentic look. I purchased a western two gun holster for my son for Christmas.I payed for rush delivery althought it wasn't going to be here on time it was going to be a couple days after Christmas. I was surprised to get before Christmas . and I ordered it way to big . So I bought another one and a singal gun holster for my self we like them a lot they are very well made. and I retuned the first one and historic emporium refunded my first purchase to my card with no problem. We were extremely pleased with our purchases for both myself and my wife, Lorraine. Our clothes were a real success at a ' Old West' wedding last weekend. A local dressmaker, who made minor adjustments, was extremely impressed with the quality of the clothing and the price - she said should would not be able to price-match! Will certainly purchase more clothing, although we have to wait until the $US and $AU are a good exchange rate.